We're gearing up to running a new round of 23 Things for Professional Development course, and I'm trying to streamline the sign-up process. Person enters their details (blog title, blog URL, location, type of library work they do) into a Google form. Someone from cpd23 team checks the details, and saves the blog as a link in Delicious. The Delicious bookmarks are useful for people looking for blogs to follow, and feeds from Delicious are used to maintain a list of all participants on the cpd23 blog, and a 'latest sign-ups' widget, too. A task on ifttt.com takes new Delicious bookmarks and inputs them into a Google Reader folder. (Reader will usually find an RSS feed direct from a blog homepage URL. A 'latest cpd23 posts' can be created using Blogger's blog-list widget - pulling in feeds from the appropriate Reader folder. This bit is all OK. But last time round we also had an aggregated feed of all the posts from all the participants. Now, as we had so many participants, the feed was *huge* and I'm not sure if anyone made practical use of it for very long, but it's the principal of the thing that I'm interested in. Last time, we achieved it by creating a Google 'bundle' of feeds, and then running that through a Yahoo pipe to make a single feed. But keeping the bundle up-to-date was really fiddly (just because of the way Google organises things). So, does anyone know of a way of automatically adding feeds from a specific folder to a bundle? It's easy to do when you first set up a bundle, but if you add anything new to the folder afterwards (which we will be doing), then you have to add that manually to the bundle, too. Or, does anyone know of a different, better, way to automate getting from a feed of new delicious bookmarks to an RSS feed of the posts of all the blogs thus bookmarked? This is a quick round-up post of some recent reading, announcements and events. I've shared much if not all of this on Twitter, and it seems worth sharing here too. CILIP is holding its annual New Professionals Day this year on 11 May. It's already fully booked, but there is a waiting list. I was delighted to be invited to give one of the nine workshops on the day. Under the unimaginative title 'Special collections librarianship: What's it all about?' I'll be taking a look at what special collections librarians do, what skills they need, and ways of getting into special collections work. Do let me know (in the comments here, or at maedchenimmond at gmail dot com or @girlinthe) if there's anything in particular you'd like me to cover. I'll be making the workshop materials available online after the day, so do get in touch even if you can't be there in person. Continuing the careers theme, Brianna Marshall has written a great post on getting special collections librarianship in the USA over on the Hack Library School blog. Do read the comments, too, for some further useful thoughts. Polly Harper, current graduate trainee at Newnham College Library, Cambridge, has written an engaging post about her recent experiences taking part in special collections outreach in Cambridge on the always excellent Rarely Sited blog. She ends by wondering which library sector will afford her the most opportunities to engage in this work later in her career. Geoffrey Little (Concordia University, Montreal) has an article in the forthcoming issue of The Journal of Academic Librarianship reviewing some of the ways in which special collections departments are harnessing technology. I'd say that the article itself doesn't break much new ground, but the references are quite handy. Anyone who has looked through a high-end antiquarian bookseller's catalogue will have noticed that they can and do include far more information about the books (contents, significance, history, condition, details of binding, etc.) than most of even the most detailed rare books cataloguing can manager. Mike Widener has written a very interesting post on the Yale Law Library Rare Books Blog about how his library is including booksellers' descriptions in the catalogue by making use of the OPAC's 'add a review' function. Two immediate concerns: booksellers' copyright and disclosing sensitive information are dealt with by asking permission first, and by not including price information. I'd love to hear if any other rare books libraries are doing similarly and whether they have had any problems with it. Sarah Werner has written a great post about this - do go and join in the conversation there (it's sad that the original post doesn't allow comments). A display of material from the museum's archives has just been opened in the Segwick Museum of Geology in Cambridge. It's great to see that museum recognising its documentary holdings and heritage like this. The Library & Information History Group has organised a walking tour of 'some of London’s forgotten book collections', led by Dr Alice Ford-Smith of Dr Williams's Library. Booking is essential, and I hear that tickets (£10) are going fast! The Leeds Library is holding a one-day conference on 'Books of every variety of taste' - The advance of the library in the long-eighteenth century on 12 May. The programme looks very interesting, and it's a chance to visit the oldest surviving subscription library in the British Isles. Booking closes on 1 May. The East of England Branch have organised an audience with Phil Bradley on the afternoon of 12 May, taking place in central Cambridge. The theme is ''Making CILIP work for you', and it's open to members and non-members alike. Mashed Library events are unconference-style gatherings aimed at sharing ideas to do with using and reusing library data. MashCat is a Mashed Library event focussing on catalogue data, and open to cataloguers, techies, and anyone else who's keen and interested. It's happening on 5 July, in Cambridge, and booking is now open. It's hard to move on GLAM blogs at the moment for posts about Pinterest, one of the hottest new(ish) social media sites in town. it automatically links every image back to the page from which it was 'pinned'. It's a powerful combination of attractiveness (and ease of use) and usefulness (linking images back to their homepages: so a picture of a cake links back to the recipe, for example). People are using Pinterest to collect together images and ideas around a multitude of themes: boards about weddings are popular, as are recipes, home decorating, and crafts. How is this different to Flickr? Well, for starters, it's not just about publishing your own images: it's a tool for bringing together images from lots of different sources. But even from the perspective of an institution wishing to create boards of its own photographs, Pinterest is much more easily social than Flickr, and it's much quicker to navigate. 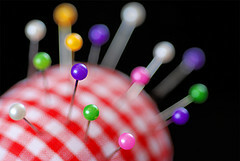 put a 'pin it' button along with other social media sharing options next to images on your collections pages or online exhibitions pages - this will give visitors explicity permission to pin the pictures and thereby share them outside your usual visitor base. Lots of people will likely pin even without express permission, but it's good to be clear if you want to encourage this! either for quick and dirty online exhibitions, or to highlight particular items from a physical exhibitions. I love this Brief History of Manchester made by Manchester Archives. you can also draw together material from other places that relates to your holdings in some way. Kettle's Yard art gallery has put together 'If you love Kettle's Yard you'll love...". It's easy to change your pins and boards whenever you need to. 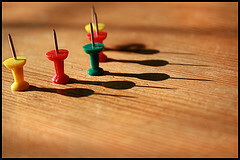 There has been much discussion about whether and how Pinterest and its users violate copyright. It's quite possible that pinning copyright images on Pinterest constitutes a violation of copyright, although that's not certain yet. I am not a copyright lawyer, and I don't know what the definitive line on this issue is. However, there are ways of using Pinterest without using copyright images at all: if you use images to which your institution holds the rights (with appropriate institutional agreement where required), or if you use creative-commons-licensed images (in accordance with the licence terms), or copyright-free images. It means you can't pin and re-pin at will without a moment's thought, but it's worth being punctilious when acting institutionally! Today's Arcadia Seminar was give by Dr Kamal Munir on the topic "Kodak and the Creation of Popular Photography: Explaining the Life and Death of an Icon". 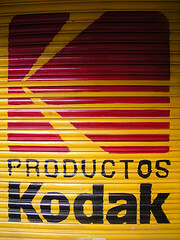 The famous photography firm Kodak recently filed for bankruptcy. This talk looked at the reasons why a market-leading, world-famous company could be so thoroughly upset by technological change (the move from film to digital). To understand Kodak's recent history Munir argued that we have to understand the origins of Kodak's success. When Kodak first started, it sold film cameras in a world where photography was practised by professionals using glass plates. Kodak's film cameras were easy to use, and cheaper than the standard, but the market that then existed didn't want them: the quality wasn't nearly good enough for professionals. Kodak had to create a market in order to be able to sell its product. First of all it marketed the cameras to children, but soon moved to marketing them to women. In addition to marketing to woman, Kodak created the suggestion that it was important to record the significant events in life, and to take photographs on tourist holidays. Munir argued that Kodak set up women as the 'archivists of family life', implying that they would be letting their duties slide if they weren't photographing birthdays, marriages, Christmas, christenings, etc. By the 1970s or so, 60% to 70% of photographs were being taken by women. This marketing strategy success was supported by a sound financial model: there was a huge (70%) mark-up on camera film. Kodak never sold expensive cameras - in fact, it could almost give the cameras away, as everyone had to go on buying film. Digital photography--which really started to take off when PC and internet access (especially broadband access) picked up in the mid 1990s--changed a number of things about the culture of photography. It meant that, at least in the earlier years of take up, more photographs were being taken by men than women (80% by men), that photos were now more casual and less sentimental, and that photographs were taken more to be shared than to be preserved. Deride it. Kodak made statements about how people would always value having physical copies of photos and that they wouldn't accept the lower quality of digital images. Try to co-opt the technology. Kodak made some small changes to try and cope with the change. The APS film system (making things smaller) and producing photo CDs when processing film. All the while, Kodak remained wedded to the razor blade sales model: sell the camera (razor) cheap, and make profits on the film (the blades). It was tied into a distribution model for this lucrative old technology, and resisted finding innovative ways to meet the challenge. This was a very engaging and enjoyable talk. I've never studied any aspect of business, and I'd never really thought it much interested me. But the talk really got me thinking about how and why business works, about what Kodak could have done differently, about what other companies but be in a similar position (could it be Tesco? ), and about what false assumptions we in libraries might be making and basing our efforts on as we face major technological change. ETA: John Naughton introduced the talk by wondering whether we, as librarians are making false assumptions about how can survive current technological shifts. Is the belief that service is the answer well-founded or not? Could we be the next Kodak? Obviously, if we don't make any changes then the answer is likely yes, but are the changes we're trying to make really the right ones? A recording of this talk will be available in due course on the Arcadia Project podcasts page. A couple of weeks ago I went over the The Other Place for a conference about library history. The conference was very interesting, but I did manage to sneak a bit of time away from it to visit some of the other attractions of Oxford, and I thought I'd record some of my thoughts about what I liked. This exhibition looks at the variety of stories captured under the heading 'medieval romance', and how this genre has influenced later writing, right up to the present day. It's a vehicle for the exhibition of a great number of medieval manuscripts, alongside some artefacts and some archival material. I really enjoyed the selection of exhibits, and the way they were presented. Objects, such as ivory panels and a floor tile are displayed alongside books and texts, thus brining to life both the expected and unexpected exhibits by bringing out some of their wider cultural and artistic contexts. The inclusion of archival material from C.S. Lewis, J.R.R. 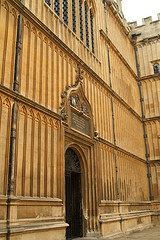 Tolkein and Terry Jones was also very successful, because of the thematic links and their links to Oxford. The inclusion of modern material may have seemed gimmicky if there weren't such strong connections with the rest of the exhibition. The exhibition makes good use of the space available. I appreciated the free exhibition guides at the entrance, and that there is a small shop (which doubles as a supervisor's desk). Two computers are also available, nicely screened off the main exhibition area, to allow visitors to explore the online exhibition. It might seem redundant to have the online version available in the physical space, but I think that it's good to be able to explore the exhibition in more than one way, and as you can zoom in to the online exhibits, it can be easier to read them and to see the fine detail than is the case with physical object in a case. A very famous manuscript (Gawain, Pearl, Cleanness and Patience) on loan from British Library. An amusing animal picture (see third picture) from a sixteenth-century personal collection of romances. Terry Jones' personal, annotated, copy of the screen play of Monty Python and the Holy Grail. Also on display was a sniffy letter from the censor complaining about the blood and the swearing,but that's not available online. It's a cluttered, busy space, which isn't necessarily a bad thing but might be difficult to navigate for a new visitor. This difficulty is mitigated by having a really clear, obvious floor plan displayed right in front of the entrance. It sounds like a silly little thing, but it stopped me getting too confused! Another thing that helps a visitor navigate somewhere where the cases are very full and busy is that the museum guide and plan picks out highlights on each floor. The location of these is marked, along with a photograph of the object in question and a short description of what it is. This helps to establish a way to approach the visit. Obviously, the museum's choice of highlight object might not match the individual visitor's favourite(s), but it's a nice way to start exploring. Again, there were computers available, this time allowing the exploration of current and previous exhibitions, and searching of the collections. Galleries 3 and 4 are dedicated to museum conservation work, and I particularly liked an exhibit that showed the effects of repeated touching on museum objects. It was made from variety of materials (silver, silk, limestone, gilded picture frame), with half of each covered by a clear perspex screen. Visitors are invited to touch the exposed side, and touches are recorded on an electronic counter. Even the most study of the materials (the stone) was clearly showing damage, and the silk had completely disintegrated. The museum has a liberal photography policy, which allows the use of cameras, without flash, for private non-commercial use, except where stated otherwise. The museum actively uses Twitter: I asked a question about the availability of the collections online, and had a helpful and friendly response well outside working hours! The only downside is that I couldn't find this advertised on their website (a missed opportunity?) - I found the Twitter account by searching Twitter itself. Figure of Nandi, the bull of Shiva.